Even though it's not quite Halloween, Emma from My Creative Time has decided to give you all a "Beary Special Treat"! This doesn't cause weight gain but will cause CUTENESS OVERLOAD! Included in this hop, you will see a "Beary Special" stamp set that was designed by Emma for this special hop! There is a large crew participating today. The MCT design team plus 5 special guests. You definitely want to hop along and comment as a fabulous prize is to be had! 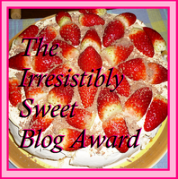 If you came from Kim H's blog, you are on the right track. 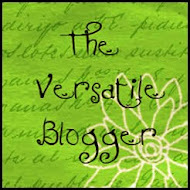 If you just happened onto my blog, you will definitely want to start at the beginning on Emma's blog. 1st GRAND prize ~ "Teddy Bear Parade" Cricut cartridge AND this newest stamp set "Beary Special Thoughts"
I created this little bear box using a variety of punches and spellbinders dies. For the free step by step tutorial to make this box and card, click on the link below to visit the download page. Isn't this set the cutest? You can order it HERE. Very pretty card and the bear is adorable! Great project!! Love the stamps! OMG...these are so super cute! Absolutely LOVE this project! beautiful! This is STINKIN cute! !Adorable!Just love it! Love both your projects. They are so so cute! Love the bear box and the card. They are both so adorable. Just love your little bear box. Great job! 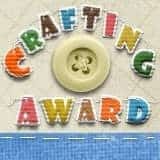 So adorable you always have the cutest projects!!! How sweet and nice or you to share! Thank you for sharing that file. What a cute set! Oh my goodness. LOVE your punched bear. And your card is just adorable, Kim. Thanks for joining the MCT team for this beary sweet hop!! Kim Score ~ As much as I would LOVE to win one of Emma's prizes, I already feel like a winner with the inspiration I'm getting in this hop!! Your teddy bear box is AWESOME, and I'm so excited, because I actually have all of the supplies needed to make it!! Thank you for the WONDERFUL step-by-step tutorial. As alway, you rock, Kim!! Love the card & the box! Thanks for sharing! Wow, that is a really cute project. Love the card too, so beautiful. O wow so cute!! great details. Oh wow. You work magic with punches. Adorable. So cute! I love the bear box and her cute "I'm sorry" eyes. I love those stamps. Thank you for this opportunity to win such great prizes. Kim ~ OMG! This is so INCREDIBLE! I just LOVE the card ~ the image in the circle, the papers and the design! But that bear is ADORABLE!!! I may have EVERYTHING to make this too! YEAH!!! Thank You for the download too ~ that is so sweet of you! You know how much I admire that you make these using dies, punches, and nesties ~ I so LOVE that to pieces!!! AWESOME job!!! oooo thank you for Sharing the link!! Loving the stand up bear, so darling. Awww... your bear is so sweet!!! What a cute bear box and card to go with it! Love that big punch and die bear. Also love that you used the patterned paper for the stamped bear. Too cute! TFS. What a gorgeous bear box and card. WOW, love that. I love your card. Very cute. I'm real curious about your box so I will have to download the file and check it out. Thanks so much for sharing. Your card is so sweet, love the bear. Thanks for sharing. Thanks for the tutorial for this card - it's so cute! Love SU! Adorable box. Thanks for sharing. oh so cute love those bears tfs! Awwww...these are just DARLING Kim!!! LOVE the pink and brown together!!! Excellent job. Love, love, the bear. So cute. Your card is adorable and your bear box is fabulous!!! So very cute! Love how you created the bear! Kim, Thank you for sharing your card with us. This is such a cute card. I love the bear!! Great job on both projects. Cute as ever Kim. Love both the card and box. I like the little gingham bear. Very cute. Will have to lift this. How cute, this is just adorable! Love the card and box. Thanks for sharing. Very nice card and the teddy bear is so cute! Love both your projects..your card is adorable!! I love that you stamped the bear on the patterned paper of the card, it really ties the project together. Both of your projects are so cute. I love how you piece your bears together (adorable)! I love this little bear. Thank you for sharing. OMG! Too cute. Really liking the brown with the pink. Great color combination. Thanks for sharing. SOOOO very cute!!! Looks like you put alot of work into that adorable little bear!!! Thanks for the free download Kim! Your card and box are adorable! This is so adorable, beary cute!! What a precious project, love the fun colors on your card and the bear is the most adorable thing. I'm so loving the new stamp set! Your teddy bear box is super amazing. Thanks for sharing the instructions. Too cute! I always love your projects! 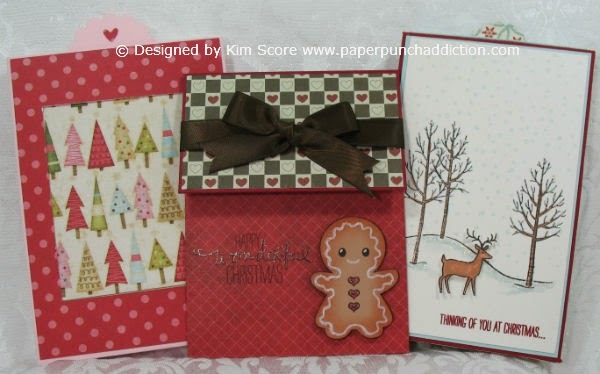 How clever to use punches and dies to make your box and card. So very cute! Perfect for the new stamp set. Great job! Your Teddy bear box is beautiful! Thanks for sharing the instructions that always a special treat. Such a cute project - thanks for sharing! Adorable card! beautiful papers and cute teddy bears! Awesome project, Kim! Your bears are so adorable! I love how you used the background paper for your bear on the card - the gingham bear is precious! Beautiful project! Love the eyes on the bear. Love the card, it's very pretty. Great face on the big bear. You always have such nice projects and I enjoy your blog. Thanks for sharing. Your bear is adorable! Love this stamp set. Not sure if it took my first comment or not. I love this card, it's so pretty. Love the face on the big bear. Thanks for sharing. Oh my! That bear is so adorable. Thank you for sharing the tutorial. This is a must make for my grandchildren! oh wow! this is amazing! I love the box bear and the card is awesome too! love the color of the plaid bear! great job! Kim, these are darling and would be great for a baby shower! You are so very talented. Wow, I love both the card and the box. But the box what a great and different idea. Thanks for all you do! WOW!! That is amazing how you made that bear out of dies and punches!! It is adorable and so is your card! Very cute--I like the paper pieced bear and thanks for the download. Your card and teddy box are both so darling. Love your bears, thanks for chance to win cartridges and stuff cuz I love bears too. I downloaded your box instructions and am going to try it. Thanks for sharing. OMG! Love how you went all "Puss in Boots" with the eyes of the Teddy Bear! Totally irresistible! Oh my they are both so cute. You did such a wonderful job!!! The bear is awesome, like the colors and those big 'ol eyes. Love the use of Emma's bear stamp on the card. Adorable. Love the cute card. Perfect. Great project. 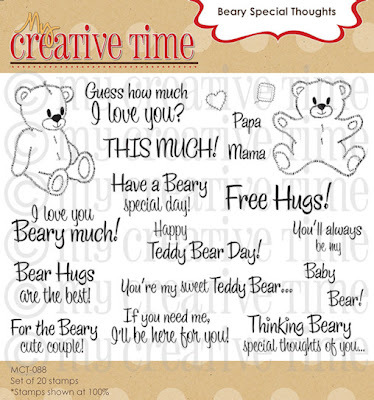 Love this bear and the sentiments work great with them. Oh, my gosh! I love that you stamped your bear on gingham paper! Very cute! Wish I would have thought of it! Love that you did a matching card with that adorable bear. Cute! 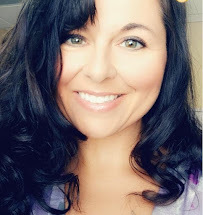 my first time to your blog! I am looking forward to coming back. I love your pretty card and your bear out of punches & Spellbinders is IMPRESSIVE!!! :) I can't wait until I am on my home computer to download the instructions! The eyes have it Kim....how so stinkin' adorable. The stamp set has soooooo many possibilities. Love both projects. What an ADORABLE card! Love these cute teddy bears! Thank you for sharing :) ...have a wonderful day! Love the card so cute. Beautiful. The faces all of you girls have given these bears are THE BEST!!!! I just can't get over how cute they all look. Darling. Beary cute. Love the new stamps. Very adorable projects! Thanks for sharing! Oh how cute! What an adorable bear! Great colors, so cute! Love the bear thanks for sharing the download. Oh my! Your teddy box is way cool! Thanks for the instructions, too! 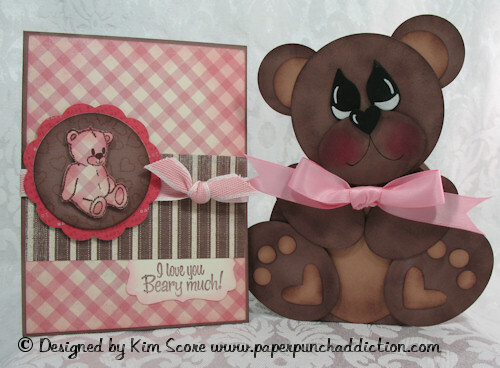 Your card is so perfect to show how Emma's stamped bear looks so adorable in pink gingham!! OH MY GOODNESS, I love these ideas "Beary Much"! Thanks for sharing them and as always I cant wait to try to make my own. So beary cute!! Sorry, couldn't resist! LOL! Love your creations!! What an adorable card, I love the big bear!!! What an adorable set!!! Love your added touches!! I really like your work. Thanks for the chance to win. This is so cute Adorable bear!!! I love the Teddy Bear!! He is adorable! Thanks for the chance to win the candy. Both of your cards are do sweet! Love the new stamp set! How many ways can I saw "AWESOME"? On to the next blog...hop.hop.hop. Teddy bears are thr best!!! 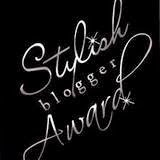 Hope I win one of these great products!!!! Your Bear box is the cutest thing I've seen ~ just adorable! Love the bears - waay too cute!! Beary Cute cards! Love the pink and brown together!! Cute bear box and card. Thank you. Your Teddy Bear Box & Card Are Super Super Cute!! Kim you did a great job on the bear. Beautiful. Thanks for a file that you provided. Super sweet card/ box set Kim!!! Your projects are always fabulous! TFS. Love this project. Your blog is so interesting. I love to see what you will come up with next. Cute! I love that pink gingham and the fact that you shared so many great details!! ooooh these are sooo cute! Wonderful job on the bear. Just came by from Kim H’s blog hop; but wow on bear box, you should really make a tutorial on that its super cute! Wow! This is gorgeous! You always make such beautiful projects! So glad to have you along in our special hop!